Groups: The Clays and The Chlorite Group. 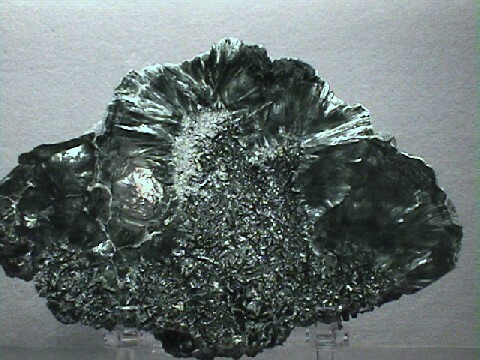 Clinochlore is one of the more common members of the Chlorite Group of minerals. These minerals are all difficult to differentiate by ordinary means and often the general mineral name chlorite is given to specimens that lack distinguishing characterics. Clinochlore forms from the metamorphic and hydrothermal alterations of other iron and magnesium silicate minerals. Clinochlore gets its name from the Greek words for inclined and green since its structure is monoclinic and its common color is green. Clinochlore forms a series with the mineral chamosite. Chamosite is the iron rich equivalent of clinochlore. Their properties are only slightly different with chamosite being darker and less transparent than clinochlore. A chromium rich variety of clinochlore is known as kaemmererite and is quite beautiful and wonderfully colored bright lavender to crimson. Color is usually green to an emerald green but also red, brown, tan, yellow or white. Crystal Habits include pseudohexagonal tabular crystals with tapering pyramidal terminations. Commonly foliated, fibrous, granular, earthy, massive. Twinning is seen on some larger specimens. Specific Gravity is 2.6 - 3.0 (average). Streak is greenish white or white. Other Characteristics: Cleavage flakes are flexible but inelastic. Associated Minerals include pyrite, quartz, dolomite, fluorapatite, gmelinite, rutile, siderite, albite, anatase, calcite, catapleiite, talc, chlorite, sphalerite, serpentine, actinolite, biotite, tainiolite, olivine, plagioclase, chromite and uvarovite. Notable Occurrences including the type locality of West Chester, Chester County, Pennsylvania, USA as well as The Tilly Foster mine, New York; Pima and Yavapai Counties, Arizona; New Idria district, San Benito County, California and Franklin and Sterling Hill, New Jersey, USA; Tirol, Austria; Val Malenco, Lombardy and Ala, Piedmont, Italy; near Zermatt, Valais, Switzerland; Spain; Shetland Islands, Scotland; Kop Daglari, Erzurum, Turkey; Ural Mountains, Russia and most localities from where chlorite is found. Best Field Indicators are crystal habit, softness, color and cleavage.